We discuss the newlyweds in Spain. Their picture has just popped up on Instagram. I confess now this is something I could really long for. I might even really want to do this, go there. They are sitting under a shade tree, white linen table spread like a banquet with olives and wine and cheese and the cured meats. And they are smiling relaxed newly married bliss-filled smiles. We are riding down the salty creek in our little boat when we stop to visit with friends sitting up on the top deck of their house boat. They are breathing in salt and watching the old lady dolphin swim, rising up above the surface now and then, she smiles at them. And they exhale the stress of their long work week in a thriving restaurant business. Owners never seem to sleep. I tell her “I hope you have a wonderful sunset tonight”. And her response is Elizabeth, you know, I really don’t care. Her cup is full with all that is there. There is nothing lacking in her dusk date with her husband. And they tell us they are celebrating ten years of being in business with a really big trip. They are going to Scotland for three weeks. I exhale, ah Scotland. And remember my two trips there. Lovely, they were. Good memories I have. And it creeps up again, this hazy desirous emotion and longing. Should I stay or should I go. In my inner parts, into my day dreams. Into my internal wish list. There is a well-aged and well-tended friendship in my life. I believe I tell her everything. She has the enormous responsibility of listening to me spill it out, beat it to death, and wallow in it. My stuff. I confess, I complain, I confess some more. I doubt. I dream. And I drop off all my innermost parts at her feet. I am safe with her. And in her wisdom she reminds me that no matter what we do or where we go we always have fun, in the simple. She reminds me of this truth. We have discovered the journey into extracting maximum joy from some of life’s most simple activities. We are four. We are two couples who though we have had our passports stamped a time or two, are happiest now in the execution of a simple plan. One of discovering that life explodes with God beauty in the trips down the African Creek, the one right here in the Lowcountry of South Carolina. And life is beautiful when we pack a sandwich, even bologna, or especially bologna, and kayak out to the wooden cross on the shore of the Waterway. He came up to me yesterday with the heart of a child. Laid out all of the shells he was collecting on the kitchen table. They were all so shiny. There is a scientific term for the shimmer and sheen, the particular sparkle and shine. But the child in him just saw the shiny. And he pulled out a light and shined it on the splendor and everything glistened in this moment of ordinary. And then he brings me his two special ones. He is not a mid-Fifties adult, he is a child, wide-eyed discoverer of beauty. These he says, these are my special ones. Please don’t move them. He has found extraordinary beauty in these two found objects. Because they are imperfect. They are perfect. Barnacles and a combination of shells have been molded together by the sea to make a hybrid of beauty. And this is all we will ever need. This sacred simple.For we are learning to go into the land of discovery of the God simple. The natural wonder of the unexplored. Exploring what is under our sandy toes and sun-burned noses. We cut the motor on our favorite part of the creek and it seems that all we can see is green lush marshgrass, oystershells and sky. There is so much sky. Have I forgotten how large that canopy of unending sky is. How could I forget the shades of blues so life-giving even on a cloudy day. And water. We are surrounded by water, sky, and wonder. 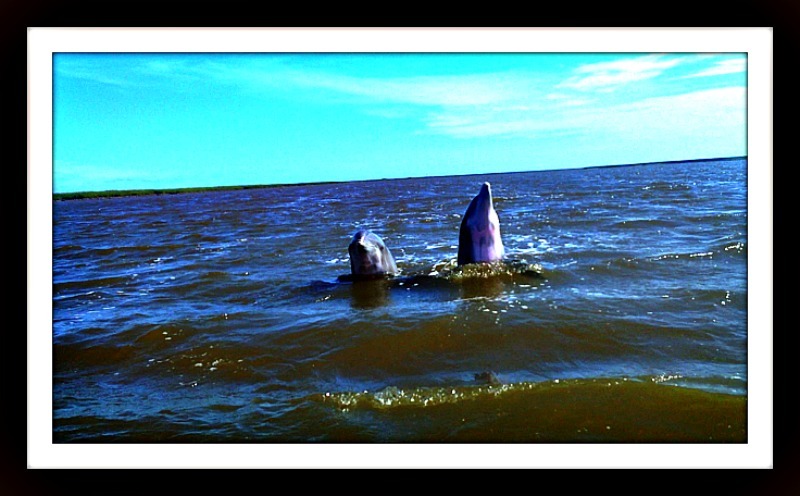 And then the pod of frisky dolphin show up and we are all children. Each one of us in our human pod of four, is a child filled with a spirit of fresh discovery. And we are narrowing. And we are traveling. And we are home. Our conversation, the one with my friend Harriet, turns to Him and any desire we have to “go and do”. It is our term for living. Unless He plans the trip, we decide we don’t really want to go after all. Because traveling on the outskirts of His will, is less than each time. And isn’t seeking Him as children the better way. And isn’t seeing His world as children, with the impressionable spirit of a discovering child the most tender way. Our conversation, the one with my husband, turns to an older couple who are no longer walking out this earthly life. He reminds me of their routine. He says do you remember how they would get into their boat every night and ride out to see the dolphin play in the surf. And they died not long after that. I wrap my mind around age and living simply and death and heaven on earth, the glory in the sacred daily wonders. And realize that there is beauty in the narrowing, in the simplifying. We are soaking in the wonders of our Sunday, a day that we marked as family day and prayed would be the beginning of the best summer of our lives. This house we are renting to “test drive” this new town, to see if it likes us and if the feeling is mutual, has a wonderfully small kitchen. We are bumping into each other preparing our summer supper. And my husband yells, Look, Come See This is Classic. When he calls out wonder and beauty I have learned to listen, to stop and look. He means business when he sees moments of grandeur. I walk to the glass front door and see the neighbor’s chickens are out running around her neighbor’s yard. And we laugh at the sight of chickens out of place. And the variety of the brood, there seems to be one of each. The silkies might be my favorite. And we laugh some more and find surprise in the spontaneous wonder of chickens running around the green lush lawn of a neighbor who carefully maintains a beautiful yard. She just happens to be out of town this night. And who needs wine and cheese in Spain after this. This most perfect day. The vision is wide in the narrowing.